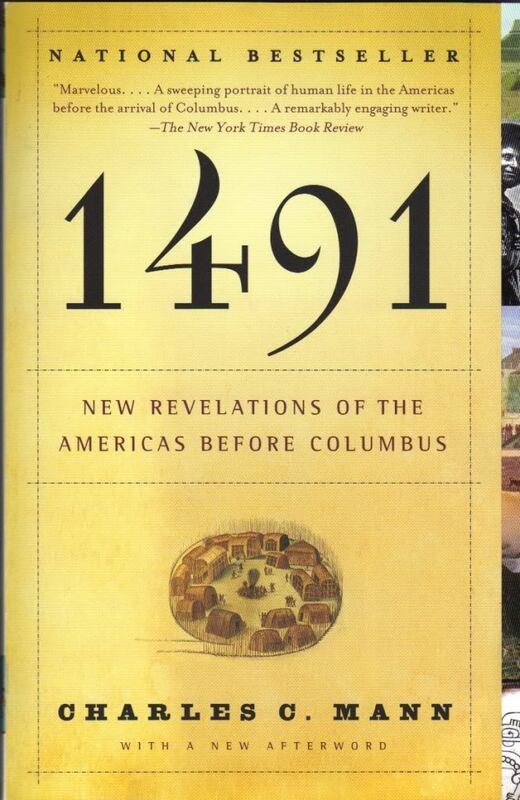 I’m way late to this party, because 1491: New Revelations of the Americas Before Columbus came out in 2006 and was a best seller, so it’s probably not news to many of you that this is a fantastic book. 1491 is a depiction of the Americas just before and just after contact with the Europeans. The gist of it is that the peoples of the Americas were much more populous and their civilizations more advanced than we are taught in our school books. The first part of the book deals with horrific impact of imported European diseases on the native populations. I always knew it was very bad–but I never understood the extent of the devastation. In part this is because I never understood extent of the civilizations destroyed. This section is depressing, but it’s well worth understanding. The rest of the book covers so much ground that I don’t even know what to focus on. Warring archeologists struggling to define the past. The complex and fascinating debate over when and how the first people came to the Americas. (Nope, the old land-bridge theory doesn’t hold water anymore.) Grisly tales of the Conquistadors coupled with intriguing records made by Spanish scribes that offer us precious insights into the strange and magnificent technologies and theologies of the Inka, Maya and Aztecs. The mystery of the development of corn and it’s impact on the world. The true history of the buffalo and the passenger pigeon–it’s not what you were taught. The wonders just pile up. What I think back on most, though, is what is revealed through these stories about the relationship between nature and culture in pre-contact Americas. As with Tending the Wild: Native American Knowledge and the Management of California’s Natural Resources , which we’ve reviewed here before, a picture rises of very active human management of natural resources. All across the Americas there is compelling evidence of intense landscape management practices which in most cases (but not all) managed to provide for the needs of burgeoning human population without destroying the land. This is permaculture. The real deal. There are so many lessons to be learned from these ignored histories. And what’s most interesting is that it seems we are only able to understand the skill and knowledge these lost people now, because we are only just becoming able to conceptualize more subtle relationships to nature. For instance, until we began to understand food forestry as a legitimate agricultural practice, we had no hope of recognizing an ancient Amazonian food forest when we saw one. You can hear 1491 author Charles Mann deliver an interesting lecture, “Living in the Homogenocene: The First 500 Years” on the Long Now Foundation’s podcast. I have a BA in History, and this entire book was a revelation. I kept saying aloud, “Why haven’t I heard this before?!?! ?” I absolutely love this book and recommend it to people whole-heartedly because of the information it contains and the way it’s written. I’m reading 1493 now and it’s just as good. I never knew that earthworms weren’t native to NJ! Another remarkable fact in 1493 is the possible cause of the cooling in the 17th and 18th centuries. The 18th century was remarkably cold (the Thames froze in London, Washington crossing the Delaware filled with chunks of ice), but they think that happened because of a lowering of the CO2 levels. Since the Native Americans were no longer burning the vast acreages of North America, greenhouse emissions went way down and the globe cooled. We may have possibly already gone through man-made climate change! Very fascinating. Yes! The sequel! I’m waiting for 1493 to come up on reserve from the library. It looks to be just as good. a great book. If you haven’t read it yet, I STRONGLY recommend you read William Cronon’s “Changes in the Land: Indians, Colonists, and the Ecology of New England.” There are really three different protagonists in this book: Native Practices, Colonial (European) Practices, and the Ecosystem itself. A classic. Thanks for your blog. I adore those “Did you know…?” sort of books. Thanks for the suggestion. Living in South America, I see first hand remaining indigenous cultures and recognize so much of it as permaculture, which is amazing. I also notice a lot of people living in rural areas who are practicing a sort of accidental permaculture, using techniques handed down from those native peoples, not because of any particular reverence for mother earth, but just because they work and people have always done it that way. Unfortunately, because they’ve lost that fundamental reverence, now they also dump a lot of cement and other unnecessary contaminants in the mix – the tendency is to embrace technology for its own sake without analyzing its real impact. That’s where a new phase of education is needed – what is “appropriate technology”, and a re-awakening of understanding our true place in the ecosystem. Can’t wait to get my hands on a copy of 1491 – thanks for the review. i was about to recommend this! but rather than focusing on just one era, this book covers the discovery of america through about 2002 or so. I read this book shortly after it was published while on the way to the Peruvian Amazon. It was revelatory, to say the least. I “loaned” it to a friend there, and it made the rounds in the ex-pat community till it fell to shreds. I hope it was composted and turned into terra preta. The part that blew me away was the fruit “orchards” in the Amazon river region. Does a book pushing unsupported assertions that are directly contradicted by solid science not leave in question everything it contains? Are you not left having to fact check every statement in it? The most significant genetic testing on Native peoples has occurred since this book was written, so I guess we allow for that, but when you take one man’s *interpretation* over hard science, you do yourself no favors. Fact is, there is thus far no evidence of European or modern Asian genetics in the indigenous populations of the Americas pre-1492. You’d expect some mixing with the Norse post-1000 AD, but they didn’t mix with the natives in Greenland, either, it seems, preferring to die off rather than adapt to or adopt any indigenous survival strategies.